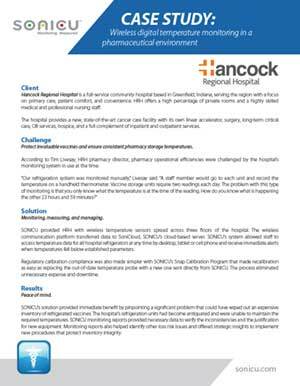 Find out how Sonicu wireless temperature monitoring increased Hancock Regional Hospital pharmacy safety and efficiency. Temperatures are consistently monitored and automatically logged and formatted for effortless regulatory compliance. Stop manually checking and logging temperatures now by filling out the form below.